•Though America’s Civil War ended 150 years ago, its issues and its symbols are still a dramatic and sobering part of today’s headlines, brought to life in Every Family Touched. •Bel Canto’s annual Christmas in the Basilica concert is like lovingly unwrapping treasured ornaments to place on the family Christmas tree. •Inspired by the nonviolent philosophy of Gandhi, Dr. Martin Luther King, Jr., rose to prominence as a leader for equality and civil rights. Each year Bel Canto joins with the Northside congregation of Holy Redeemer Church of God in Christ to celebrate King’s dream. •In Revelations of Divine Love you will be among the first to hear two gorgeous, new works, and you’ll leave wanting to experience them again and again. •For Travels on the Silk Road, the Orchid Ensemble will join Bel Canto to perform music inspired by the exotic and haunting Far East. 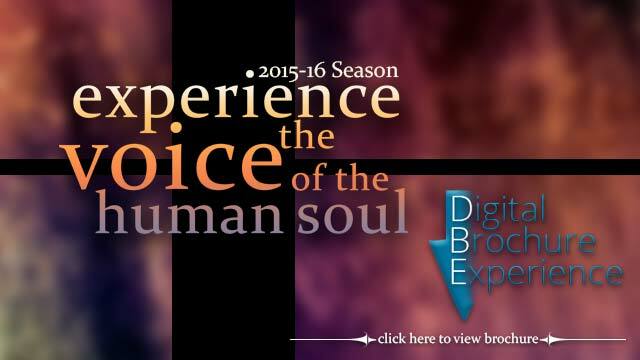 Come experience the voice of the human soul.